Six years ago Chizu Sekiguchi, contemporary basket maker and teacher, created an exhibit for us called Contained Excitement. We are thrilled that she has agreed to organize another exhibition for us this summer of contemporary Japanese woven sculpture. Sekiguchi-san chose these second, third, and fourth generation artists who are breaking away from traditional bamboo forms, using materials ranging from palm fronds, kudzu fiber, and leaf skeletons, to wire, industrial plastic sheets and paper masking tape. As in the first exhibition, some of the artists in The Nature of Things were inspired by, or were students of Chizu Sekiguchi. She was inspired by Hisako Sekijima (not in the show) who came to the United States in the late 70's. 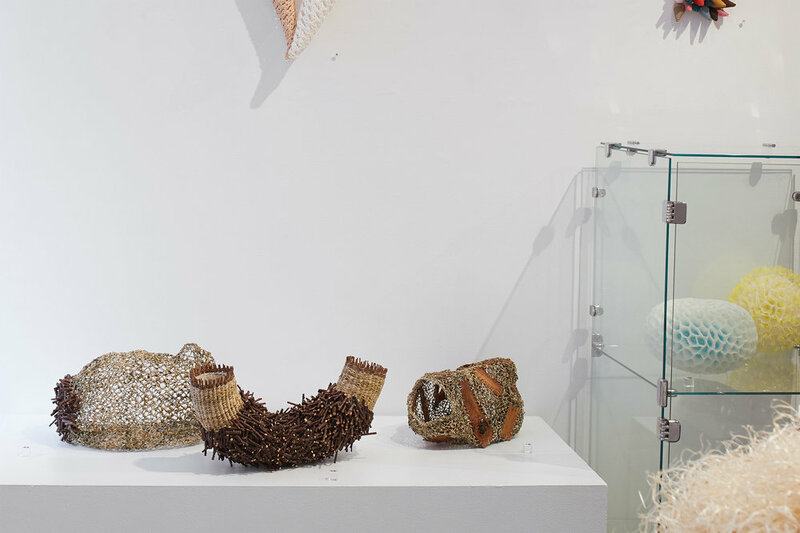 Once here, she was motivated by Ed Rossbach, John McQueen and Kay Sekimachi, some of the artists recognized as bringing the woven basket form into the arena of contemporary art. This exhibition falls snugly into our program of exploring the alchemical connection between the artist and the natural world, as a vehicle of present day animism. Even those works made of non-natural materials are commentaries on the rhythms, textures, and the artists’ deep personal responses to place, plants, environments, and the sacred spaces contained within vessels and enclosed forms. They subtly reveal their secrets. The artists have wrestled and changed those natural forms, abstracting them into exquisite small sculptures that reference Nature and yet transform it as well. Sometimes it seems the hand naturally organizes and weaves materials together as a form of contemplative meditation. In this exhibition most of the 'basket' form has moved beyond function. The earliest forms of mankind's weavings were probably containers and textiles. Their forms evolved with culture for thousands of years, ultimately transforming from utilitarian objects to objects made for art's sake. None are as simple as they might seem. Their complexity comes from the human element in their conceptions, and the human satisfaction in the range of their multiple forms.